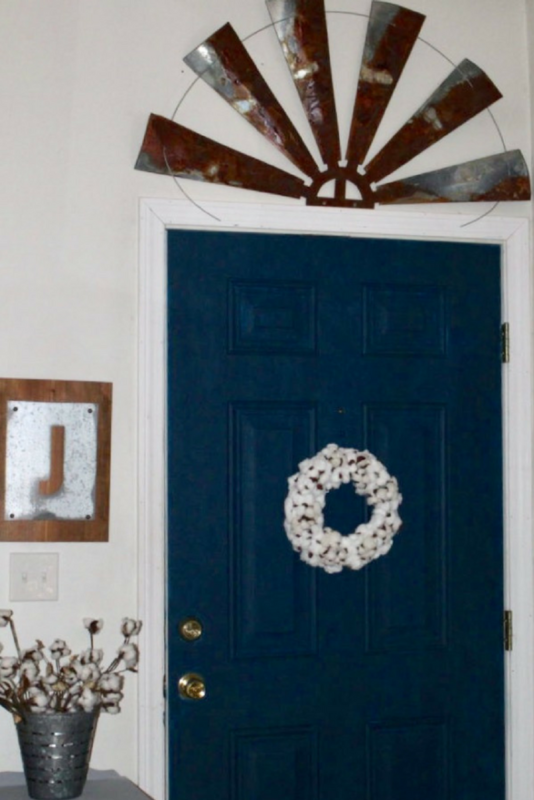 Basically, it was an unpainted metal door with a Christmas sign still hanging-oops! The side by side picture really shows the difference. This makeover came together so quickly. I don’t know why I waited so long. Here is what I did to create this inviting space. 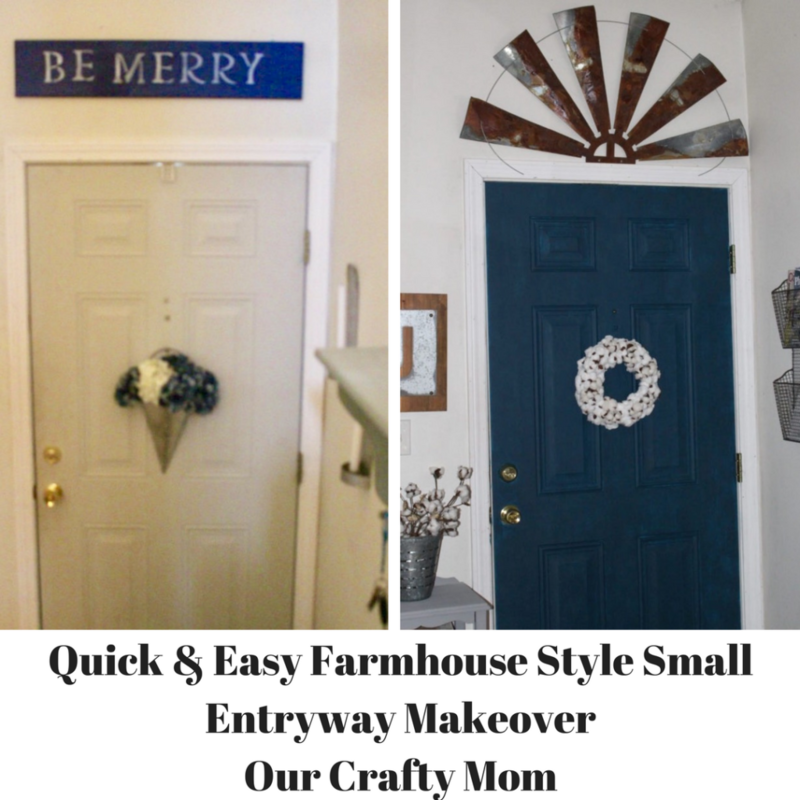 COLOR-The gorgeous navy blue on the door totally sets the stage for this farmhouse makeover. I used Velvet Finishes in Handsome. This paint really looks like velvet-the finish is that smooth! 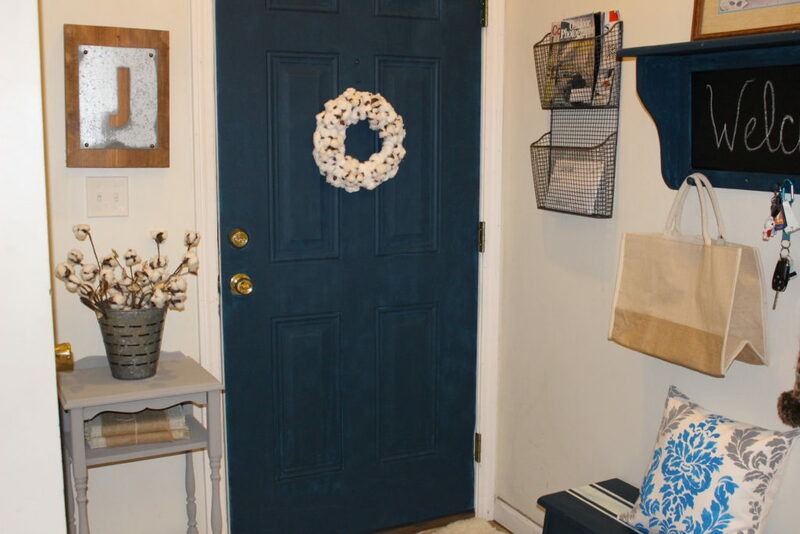 I just saw this post about Farmhouse colors and navy is one of the top pics. I had no idea! TEXTURE-This can be achieved easily with accessories. Nothing says farmhouse to me more than metal and cotton stems! 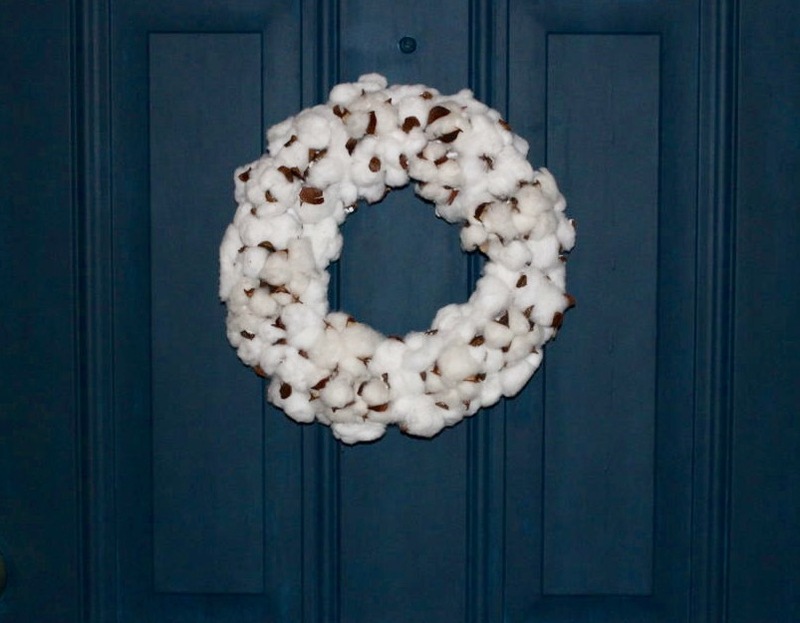 I hung my DIY cotton ball wreath on the door and placed an Olive Bucket filled with cotton stems on a small table by the door. WARMTH-The painted door immediately added warmth, but there is nothing like a soft rug to bring in warmth and texture. 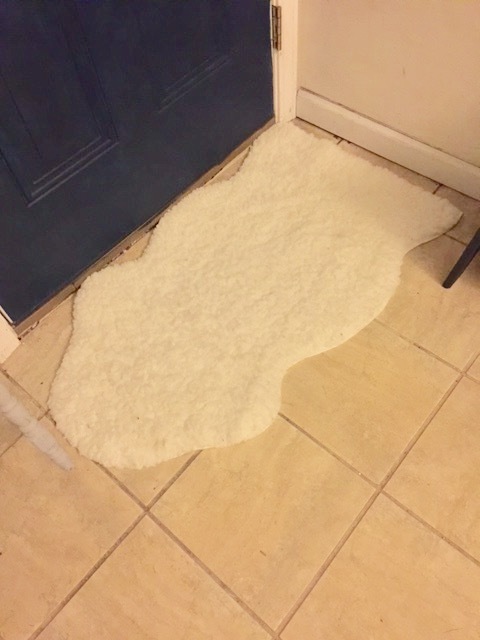 This sheepskin rug is the perfect size and very durable. 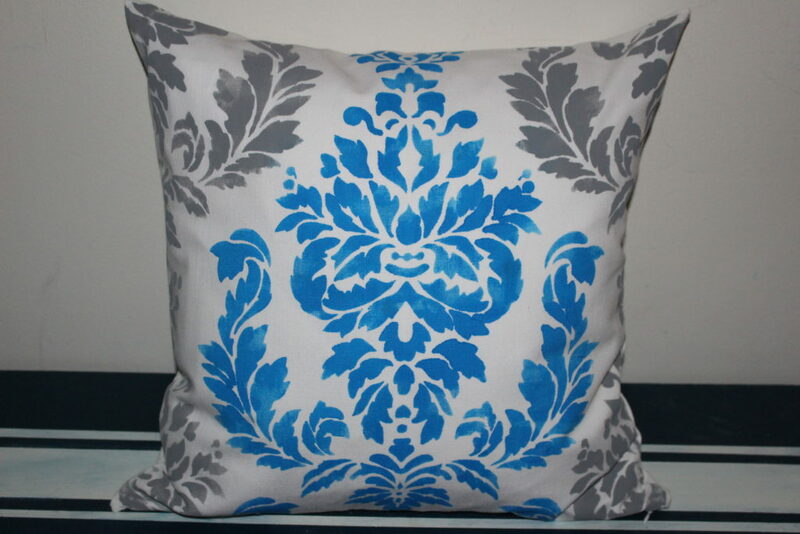 Pillows are another way to warm up a space and I will be sharing how I made this beautiful pillow tomorrow! ORGANIZATION-A metal magazine holder is the perfect spot to place the daily mail and keep magazines handy. 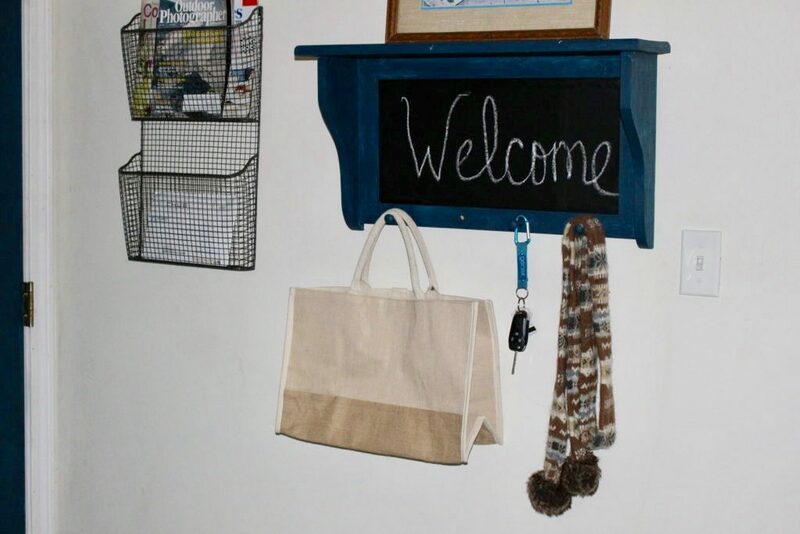 A shelf with pegs holds keys, scarves and tote bags that I can grab on my way out the door! 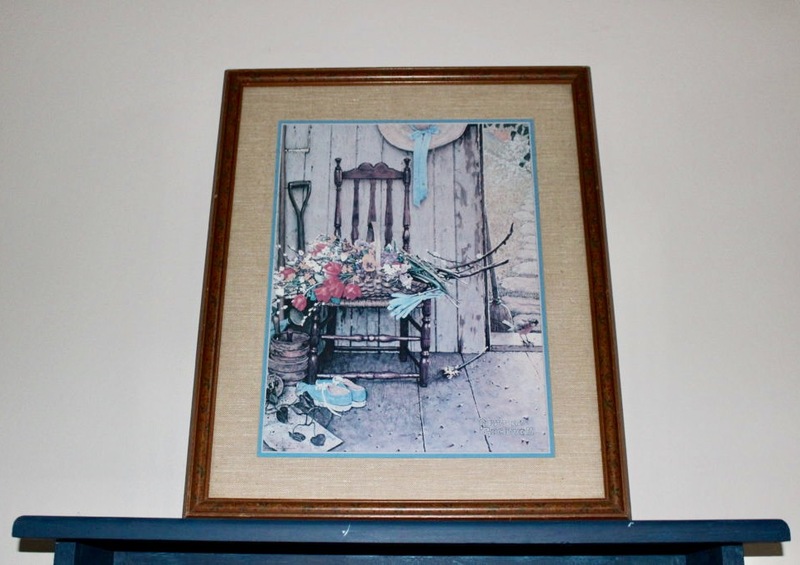 This Norman Rockwell print is near and dear to my heart, as it hung in my childhood home and was my Mom’s favorite picture. It fits perfectly with the farmhouse theme. Isn’t it just stunning? I love that it’s not something my neighbor will have and is just a little bit quirky! See the J sign to the left of the door? I made that two years ago, yet it goes perfectly with the windmill. Some things are meant to be! A big thank you to Custom Cut Decor . I am very grateful! Have a great day! I can even tell in your photos that the paint is velvety. 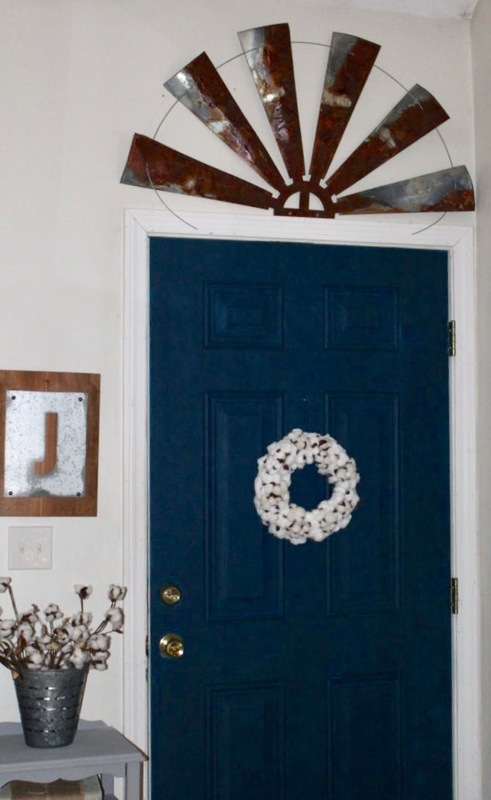 The door is gorgeous now and I noticed right away how the windmill added so much charm to your entryway along with everything else. Great project Micki! Oh, btw, the pillow is beautiful. I totally love the color of the door. Velvet Finishes surely makes some beautiful paint! 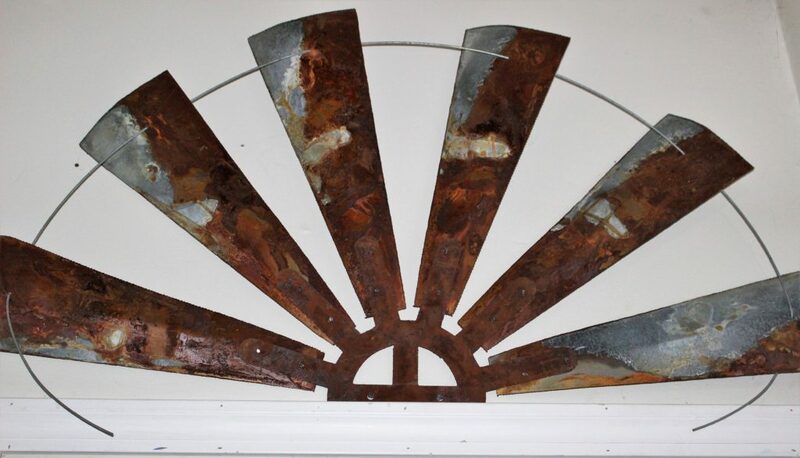 Also love the door combined with the windmill. You letter “j” is adorable, too. Lovely makeover, Micki!! 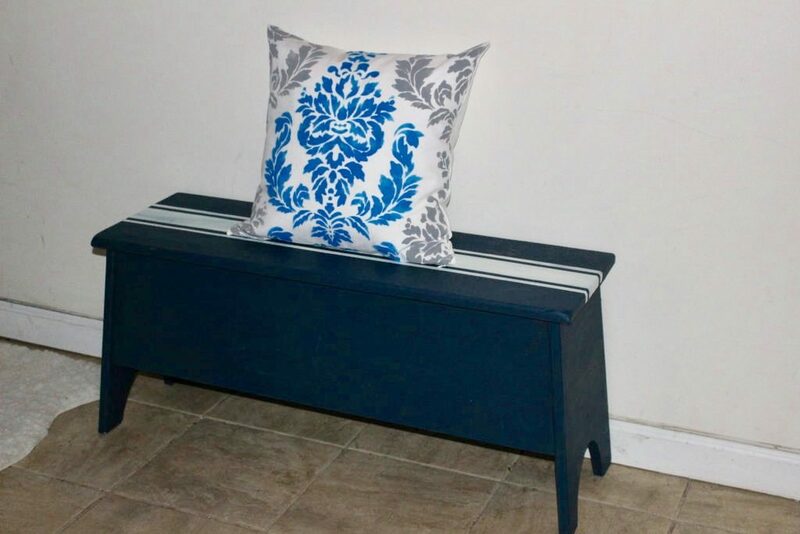 I love the idea of a pillow kit, looks very easy to do.,Great job on the door and the pillow..I love all of your projects AND ideas..
Michelle, lovely! I especially like your cotton bolls and rusty windmill. The cotton bolls remind me of my childhood. Great makeover! Thank you for sharing at the Snickerdoodle Create~Bake~Make link party! Oh that windmill and door color. So pretty.